Click the "Order Status" link at the bottom left-hand side of any page to check on your orders status. Please contact customer service toll-free 1.800.457.3501 or via email at wecare@bandshoppe.com. Click the "Order Status" link at the bottom left-hand side of any page to check on your orders status. Or visit the My Orders section of your account page to track a package. Click the "Order Status" link at the bottom left-hand side of any page to check on your orders status. Or visit the My Orders section of your account page to track a package. Be sure that all of the items in your order have shipped already. If you order displays your Package Tracking Numbers, check with the shipper to confirm that your packages were delivered. If your packages each show a status of "delivered", please contact customer service toll-free 1.800.457.3501 or via email at wecare@bandshoppe.com. If you order is missing items, first click the "Order Status" link at the bottom left-hand side of any page to check on your orders status. Or visit the My Orders section of your account page to track a package. Be sure that all of the items in your order have shipped already. If you order displays your Package Tracking Numbers, check with the shipper to confirm that your packages were delivered. If your packages each show a status of "delivered", please contact customer service toll-free 1.800.457.3501 or via email at wecare@bandshoppe.com. If you order is missing items, first click the "Order Status" link at the bottom left-hand side of any page to check on your orders status. Or visit the My Orders section of your account page to track a package. If you order displays your Package Tracking Numbers, check with the shipper to confirm that your complete order was delivered. If your packages each show a status of "delivered", please contact customer service toll-free 1.800.457.3501 or via email at wecare@bandshoppe.com. Backordered items are those which our suppliers are unable to predict when they will have more in stock, but as soon as they do, we will be able to ship the item to you. If you have any questions regarding your back-ordered item, please contact customer service toll-free 1.800.457.3501 or via email at wecare@bandshoppe.com. Checks returned to Band Shoppe due to insufficient funds will be charged $50.00. All invoices with an outstanding balance on accounts for more than 30 days are subject to a 2% per month delinquency fee (24% annually). These terms also apply to non-profit organizations and will be added to statements on a monthly basis. In the event that affirmative action is required on the part of Band Shoppe to collect the amount owed, the buyer shall pay Band Shoppe all cost of collection including reasonable attorney fees. With a few exceptions, Band Shoppe does not charge our customers extra for heavy or oversized items delivered using our Standard Service. You will pay only one shipping and handling charge that is based on the total value of your order. Click here for shipping chart. Click the "My Account" link at the top of our site. Under the login box, you'll see a link that says "Forgot your password? Click here". That link will send an email to you with your password. If you feel that you have received the wrong product, please contact customer service toll-free 1.800.457.3501 or via email at wecare@bandshoppe.com within 72 hours of receiving the product. Most items ship via UPS or USPS. Transit time depends on the service you select. Credit card orders are processed immediately and in stock items will ship within 24 hours. Packages typically arrive in 2-5 business days depending on your location. Custom items are produced on a manufacturing schedule. If you need your order by a specific date, please consider upgrading your shipping to ensure timely arrival. We cannot guarantee the exact arrival date of orders shipped using our Standard Service. Items shipped by truck carrier may take up to 2 weeks. 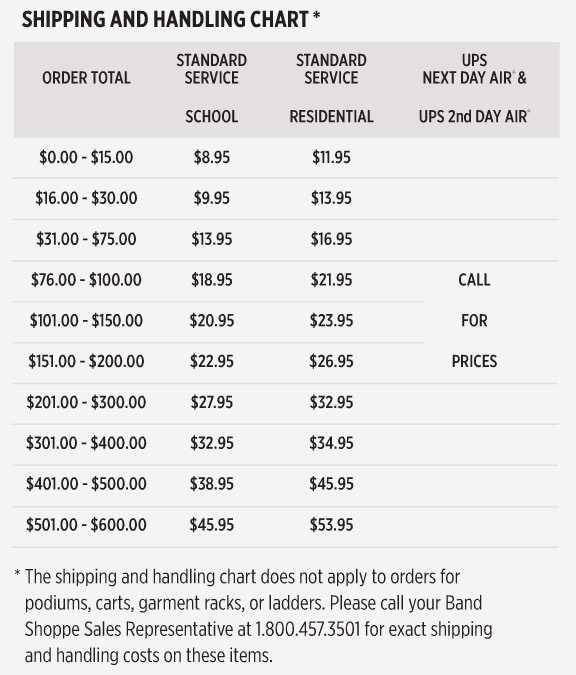 Band Shoppe will determine the most economical shipping carrier for your order. Most items are shipped by UPS or USPS. Some larger items ship by truck carrier. We have adjusted our shipping methods to offer the best possible value. 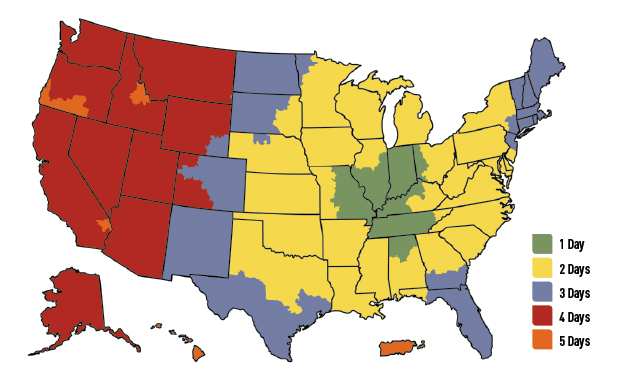 Click here for shipping zones. Band Shoppe is happy to ship orders world wide. Please contact customer service at 1.812.963.1950 or via email at wecare@bandshoppe.com for shipping cost. Visa, Master Card, American Express, Discover, and Paypal are accepted through our secure checkout system. Cardholders must provide valid Name, Billing Address, Telephone Number, Card Number, and Expiration Date. Custom items are non-returnable/non-exchangeable and cannot be canceled once the order has been placed into production. Clearance Charges In all cases, the recipient is responsible for all duties and taxes levied by the local governing authority along with any costs associated with clearing the shipment with their respective customs authorities. We are not able to estimate these charges. If you need to estimate your local costs, we suggest you contact the appropriate authorities with your order information. International orders may take additional time to process due to the completion of additional documents required for shipping and item availability as all items must come into our main warehouse before orders can be shipped. As a matter of practice, we ship all international orders once they are complete to minimize the shipping expense to our customers. If you require certain items to be shipped as soon as available, please notify us in writing and we will quote the shipping costs based on your requirements. Please note that shipping international orders in “multiple shipments” is considerably more expensive. All items purchased from Band Shoppe, a division of Pearison, Inc. are warranted for a period of one (1) year from the date of purchase to be free from manufacturing defects. Band Shoppe will, at its sole option, repair or replace defective goods or refund the purchase price. These rights are in addition to any warranty provided by a third party manufacturer. To exercise your rights under this warranty, contact our Customer Care Department for a Return Authorization Number. You are responsible for return shipping. Except as provided above, Band Shoppe hereby DISCLAIMS ALL OTHER EXPRESS OR IMPLIED WARRANTIES, INCLUDING THE WARRANTIES OF MERCHANTABILITY AND FITNESS FOR A PARTICULAR PURPOSE. BAND SHOPPE SHALL NOT BE LIABLE FOR ANY INCIDENTAL, CONSEQUENTIAL OR PUNITIVE DAMAGES that may be suffered as a result of manufacturing defects in, or the use of, goods sold by Band Shoppe. Indiana law governs all purchases from Band Shoppe. Any litigation concerning such purchases must be filed exclusively in Posey County, Indiana within one (1) year after the claim has accrued or be forever barred. BOTH PARTIES WAIVE ANY RIGHT TO TRIAL BY JURY. Any third party manufacturer of goods sold by Band Shoppe give you specific legal rights and you may have other rights which vary from state to state as some states do not allow the exclusion of warranties, incidental or consequential damages or the limitations of remedies. To pay via Check by Phone, please contact a Customer Service representative toll free at 1.800.457.3501, you must provide bank routing number, checking account number, and check number used. To pay via Purchase Order, please contact a Customer Service representative toll free at 1.800.457.3501 or via email at sales@bandshoppe.com. Mailed, faxed, or emailed copy of an Official School or District Purchase Order signed by Superintendent, Principal or Business Manager is required. Payment Terms are Net 30 Days. We do not process orders from phoned in purchase order numbers alone. Orders will be processed when the purchase order copy is received. Booster and Organization Purchase Orders will not be accepted along with any other group that is not associated with a state-recognized school or district. Please be sure Purchase Orders include the Purchase Order number, Billing Address, Shipping Address, a List of items you are purchasing including size, color, and gender, the approved amount including shipping and handling charges and authorized signature. If we need to verify your Purchase Order, manufacturing will begin on the date of verification. Prepay is available using School Checks, Booster Checks, Cashier’s Checks, Certified Checks and Money Orders accepted. NO PERSONAL CHECKS. Band Shoppe CANNOT accept multiple checks from individual members on group orders. One check or money order will be accepted from each group or organization. A $50.00 service fee will be charged on all returned checks. A returned check on an order will cause the entire order to be pulled from production and placed on hold until payment is resolved. All payments must be received in US funds. For more information please contact customer service toll free at 1.800.457.3501 or via email at wecare@bandshoppe.com. Visa, Master Card, American Express, Discover, and Paypal are accepted through our secure checkout system. Cardholders must provide valid Name, Billing Address, Telephone Number, Card Number, and Expiration Date. Custom items are non-returnable/non-exchangeable and cannot be cancelled once the order has been placed into production. Indiana residents must pay 7% sales tax on all items. Tax Exempt Indiana Residents: If your organization is exempt from paying sales tax, you must provide your signed exemption certificate with your order. Without this certificate, we are required by law to charge sales tax (7%) to Indiana Residents. If the exemption certificate is not provided at time of purchase, we are unable to refund any sales tax charged on your order. For more information please contact customer service toll free at 1.800.457.3501 or via email at wecare@bandshoppe.com. Click the "My Account" link at the top right hand side of our site to review your orders. You may compare your order history on our website, with your financial records. If you have further questions or concerns, please contact customer service toll free 1.800.457.3501 or via email at wecare@bandshoppe.com. To recieve a copy of your invoice or receipt, click the "My Account" link at the top right hand side of our site to print invoices or contact customer service toll free 1.800.457.3501 or via email at wecare@bandshoppe.com. Please allow approximately 2 weeks to process your return or exchange. School Discounts have been incorporated into catalog prices. Shipping and handling charges are added to all orders. Prices listed in any Band Shoppe catalog or advertisement are subject to change without notice. Samples of many Band Shoppe products are available by calling our professional sales staff at 1.800.457.3501. All items requested must be covered by one of our payment options. You may inspect samples for up to 15 days. After the samples are returned, your account will be credited. The customer is responsible for return shipping. To find the product you're looking for, you may (1) use the navigation menus on the top, left & bottom of our website. (2) type a keyword or item number into the SEARCH box. If you have any trouble locating a product, feel free to contact customer service for assistance. To navigate this website, simply click on a category you might be interested in. Categories are located on the top, left & bottom of our website. QUICK TIP: Place your mouse cursor over anything you think could be a clickable link. You'll notice that anytime you scroll over something that is a link, your mouse cursor will become a "hand". Whereas scrolling over anything that is NOT a link will leave your cursor as an "arrow". You may also type a keyword into the SEARCH box, then press "Enter" to quickly find a specific product. If you have any trouble locating a product, feel free to contact customer service for assistance. At BandShoppe.com, we offer you the lowest prices available. No coupon code needed! To get your free fabric swatches, visit our Swatch Request Form or contact our Sales department toll free 1.800.457.3501 or via email at wecare@bandshoppe.com. Due to the nature of custom items, including uniforms, imprints, embroidery, and digitally printed goods, these items are unavailable to purchase via our web store. One of our friendly Sales Associates will gladly assist you with a free quote packet that includes pricing and a full color sketch. To inquire about theses products and services, please contact us by phone, e-mail, or use our Sketch Request Form. Click Here to view a PDF of our current manufacturing schedule. Band Shoppe Sales Representatives are here to help! To inquire about the products and services found on our website or in our catalog, contact us by phone or e-mail. We're happy to assist you during regular business hours of 8 am - 5 pm CST. Due to higher call volume during the marching busy season, Band Shoppe has extended busy season hours to better serve our customers. These hours are valid August 15th, 2016 thru September 16th, 2016. Due to our Winter Shutdown, some customer may experience a delay in customer orders. To avoid this delay, remember to get your orders in as early as possible. Band Shoppe, Div. Pearison Inc.